December 2014 marked 40 years since the British writer Bruce Chatwin arrived in Argentina to begin the journey which would eventually form the basis of 'In Patagonia' - still one of the most seminal (if controversial) books written on the region. While it is notoriously difficult to follow exactly in the author's footsteps, we've drawn on our specialist knowledge of the region to put together a Chatwin-themed itinerary with which to inspire would-be wanderers. Day 1 - When you arrive into bustling Buenos Aires, you will be met by a local guide who will transfer you to your hotel and then take you out into the city to see the main sites. Day 2 - 3 - With your local guide you will take the Roca Train south east to the coastal town of La Plata to visit the Natural Science Museum, visited by Chatwin in order to see for himself the remains of a Giant Sloth (chapt.2). On your second day in Buenos Aires explore this incredible, diverse and captivating city. See the Pink Palace where Evita spoke to her masses, visit art galleries, the stunning Opera House or simply relax and sip Malbec at one of the many street side cafes as you watch the world go by. Day 4 - Today you will take a short flight south to the lakeside town of Bariloche. You can spend the afternoon, exploring the lake peninsula, take a kayak on its emerald waters or an afternoon hike. Day 5-7 - Your journey continues south today into the heart of Welsh Patagonia to the town of Esquel. You will visit the homes of some of the original Welsh settlers, visit indigenous Mapuche communities and experience the incredible diversity of this regions landscapes and wildlife. You'll even stay overnight in a long forgotten Gaucho village, little changed in the 40 years since Chatwin visited. You'll be accompanied by Jeremy Wood, local guide and expert on the Welsh, whose work also includes collaborating with the makers of the Oscar-nominated film, 'Patagonia' and with Matthew Rhys to create a Spanish version of the film 'Hollywood Gaucho'. Day 8-11 - For the coming days you'll take to the road to drive down the infamous Route 40. You will pass some of the most breathtaking scenery in Patagonia, pass through rural villages, see prehistoric cave painting and even spend 2 nights at a working Estancia (ranch). Day 12 - Today your road trip ends in the delightful hiking village of El Chalten. In Chatwin's day the village was nothing more than 1 house, but the jagged granite peaks of Mount Fitz Roy and Cerro Torre were of course here, towering over the same glacial valley. Day 13-15 - Spend 2 days hiking the trails of the Los Glacieres National Park to get to the base of Mount Fitz Roy with its hanging glaciers and surrounding lakes of unimaginable colours. Also visit the mighty Perito Moreno Glacier - stand and stare as you listen out, cameras poised, as enormous ice carvings crash into the waters of the glacial lake in front. Day 16 - Today you will travel through the Patagonian steppe into Chile to the town of Puerto Natales that sits on the shores of the Last Hope Sound. Day 17-18 - Visit the spectacular Torres del Paine National Park, the Milodon Cave home to the 4m-high ground sloth, and take a cruise through the fjords of southern Chile. Day 19 - A 3 hour hour journey south to the Magellan Strait takes you to Punta Arenas. Here you can visit the fascinating cemetery and grave of Charlie Milward (Chatwin's infamous cousin, whose gift of a piece of Patagonian Milodon skin to Chatwin's grandmother inspired the writer's trip to Patagonia), the Castillo Milward - the house owned by Charlie Milward - and many of the other historic and intriguing buildings and museums which tell the story of the city's 19th century heyday as a booming centre for the wool trade. See more details of things to do in Punta Arenas. Day 20 - Travel by bus, crossing the Magellan strait then down the length of Tierra del Fuego to Ushuaia, perched on the shores of the Beagle Channel and the southernmost city in the world. Day 21 - Visit and stay at the Estancia Harberton, home to the Goodall family, descendants of the English missionary Thomas Bridges, who was the first settler to make a home on Tierra del Fuego. His son Lucas' book 'To the Uttermost Part of the Earth' details the family's life with the native Indian population. Chatwin stayed with the family, remarking on the English influence that remained in elements such as the wallpaper and observance of tea time. 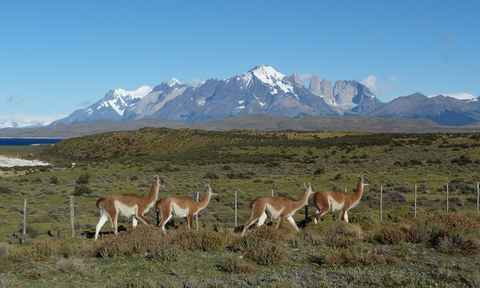 From here Chatwin walked overland to the family's second Estancia, Viamonte, which was latterly set up by Lucas Bridges. (this route is no longer open). Day 22 - Today you will take a domestic flight to Buenos Aires where, depending on onward flight schedules you will either spend the night here or transfer airports to take your international flight home.